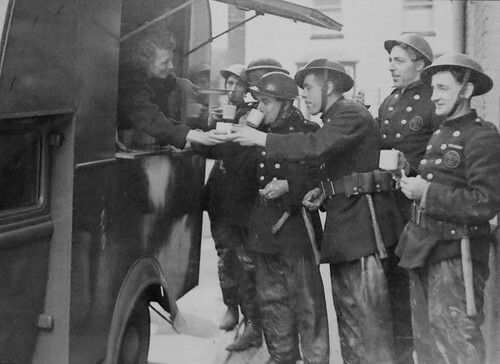 Wonder if `Fireservice war heroes` includes my Dad, who was directed to the AFS (Gravesend) at the outbreak of war. Unfortunately he was soon rather discredited when, in his day job as a painter and decorator, his blow torch set fire to some curtains and the brigade had to turn out to save the house burning down! He got the boot and after a brief period at Chatham dockyard finished up in the Home Guard for the duration. ground, at the top. I was a member of the arp, in that post as an arp messenger, from 1941--1945.
as evacuee`s. Same as the Ordnance Street bombing, before we returned. Thank you for posting the newspaper cutting KeithJG. Today marks the 75th anniversary of the air raid in Rochester that killed 3 AFS men, 2 from Rochester and 1 from Chatham as well as 8 civilians. There are accounts of the raid in this topic. There is also an extended report in today's Medway Messenger to mark the occasion. Rochester AFS Buick "straight 6" that was used for long distance work. This vehicle is known to have attended incidents at Plymouth, Southampton, Birmingham, and London during the Blitz. It is seen here at L/F Bill Beers Funeral at Strood Church in Cuxton Road, Strood in October 1940. 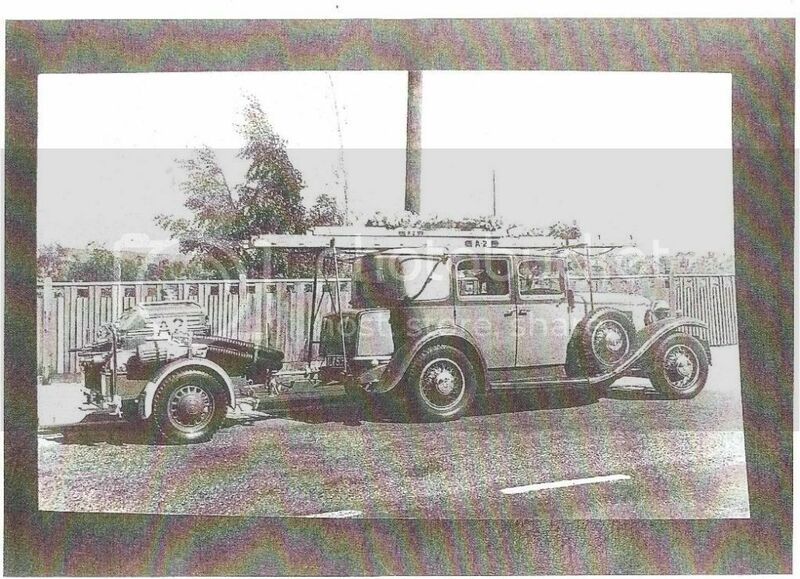 I believe this vehicle was also allocated to Elaine Street sub-station (where he was killed) as there are photographs in this topic that show Bill working on trailer pump A2 in Strood workshops, plus the ladder markings A2, on the roof of the vehicle.. Photograph courtesy of John Meakins. Former KFRS Museum Curator. This post is in response to jerryteale's post of 28/9/13. in Kemp's Fire Topic. Welcome to the KHF! From "A collection of Memories" by Cyril Ambrose Daniel, who was 3rd Ofiicer with the City of Rochester Fire Brigade during the War. Now the real war in the air had begun. As I recall we had a very big raid on our local gasworks in Gas House Lane, just off the river. They had just filled up the coal retorts when the Stukas dive bombed. Two bombs made direct hits, one on Retort House and the other on the gas control valves. Not long after therefore, a large blaze developed. The raid was just after midnight. I attended with 3 pumps and got to work with four hydrants and one pump from the river, in total supplying 8 main jets. We desperately tried to get the flames under control so that the bombers would not be able to use them as homing beacons for Rochester, (Shorts Aircraft Factory was just up-river) to try and help prevent them from delivering more nastiness. When daylight came, we could see the extent of the damage. One of the firemen said "Come with me Guv, I think there's a man`s hand in the coke heap, and sure enough there it was, and with a little digging the rest of the body was found. Much to my surprise the body was still alive but unconscious. We managed to revive him and he was not apparently injured. All he wanted was his glasses and a large glass of beer! We did find his glasses but no beer. He was sent off to hospital for a check up and was found to be suffering from shock, as we found out later. It appears he was on watch (fire watch) near the valve pit when the second bomb hit the gas valves and blew him into the 30 foot highcoke heap. The coke rolled down on top of him, but he had passed out and could not help himself. The bomb fractured all of the outgoing valves, cutting off the supply to the town. The job took three days to deal with, but it took some three months to get the gas supplies back on line. "With resolve-with valour" by David Knowles 2002. Not specifically about Kent but lots of stories of fire brigade/red cross/ARP etc. Fascinating reading. My grandfather Ron Piper was involved in rescuing 6 people after the bomb fell on Ordnance Street, Chatham on 14th Dec 1940. I have a detailed local newspaper report that mentions Mr Ronald Piper of Watts Street (joiner and volunteer fireman) and Lance Corporal W H Styles, RASC rescued the people and both were awarded medals for their bravery. 3 people were trapped in the wreckage: Mr and Mrs Mattocks and their son Oliver. The rubble was dragged away. Another 3 were trapped in a cellar beneath a shop: Mr Moir, manager, Miss I Gouge, an assistant and Leonard Humphrey, the shop boy. Piper and Sykes cleared away heaps of rubble and dropped into the cellar next door. They then cut their way through the brick wall, the work was extremely dangerous and the walls were likely to cave in at any time. Wood and slates were piled to a height of about 20 feet about the helpers and fire was imminent. It was raining heavily at the time and the rescuers were only working by the faint light of a torch, with the constant threat of falling debris. They worked from about 6.30-8.45pm. Mr Piper was shown in an official report to have complete disregard for his own safety. Ronald went on to serve as a volunteer fireman until the 1950's or 1960's. I think he was attached to the station under the arches on Military Road. Somewhere I have a leaving card to him signed by many members of the service, I will try and find it. I will also post some separate photos of some firemans` training exercises. Dover crew spring into action. Deal firemen take a break. If anybody can identify ANYONE from the fire service in any of the photographs that have been posted, can they please let me know? This must be one of the last photographs taken at the station in The Common/Corporation Street between September 1939 and June 1940 when they were forced to relocate to Foord Street. 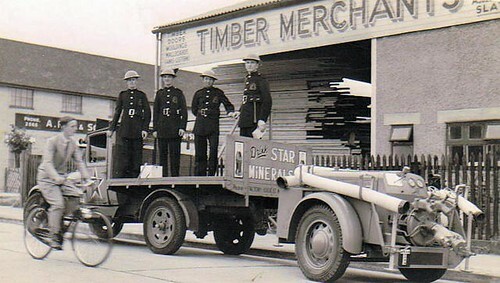 Photograph courtesy of KFRS Museum. Rochester AFS' Priors Gate House Crew with a Coventry Climax TP. This sub-station was solely for the protection of the Cathedral. 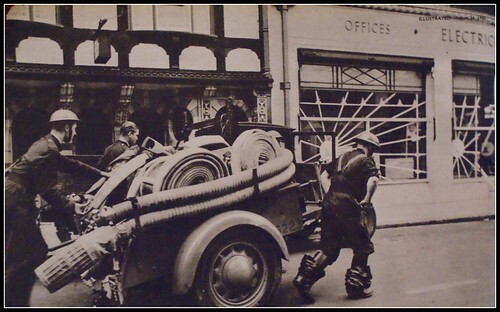 I believe the Gentleman at the rear, with the peaked cap and T-pieces on his shoulders must be the Pre-War Chief Officer of the City of Rochester Volunteer Fire Brigade, Mr S.T. Downes. He ran a Confectionery Shop at the bottom of St. Margaret's Street, just across from Priors Gate House. I also remember playing on No. 1 Onslow Rd. as a boy. It was originally a general store that was run by a Mr. Barty and his wife. They moved shop to Arthur Rd. after the bombing. Our own house, halfway up Onslow Rd. was damaged that night and we were moved to a council house on St. Williams way opposite the hospital as tempory accommodation until the repairs were complete. After the bombing our gas stove was jammed up the passage and the front door had been blown right across the street. Needless to say, the roof had been blown off.